The Happiness Project, a book that has all the ways explained of how one can be happy. Just follow those steps and you have the ultimate formula! Sounds easy, right? If it doesn’t, it really isn’t that difficult. Well, it isn’t quite easy as well. Get it? That’s how confused I was after reading the book. According to Gretchen Rubin, the steps and the procedure to attain happiness is one year long. It takes one year to complete all the steps and the rest of your life to stick to them so that happiness remains intact. 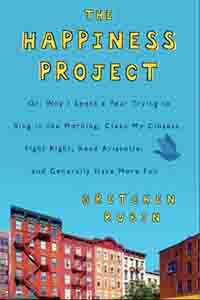 The happiness project seems systematic, tedious and tiresome. There are lists to be made, charts to which you have to stick to, rules to be followed, rules to be broken, things to be bought and much more. Since I have a strong belief that every book teaches you something… this particular piece isn’t entirely useless. It also has some very helpful advices and tips on how one can try to be happier in her/his life, like in the chapter ‘February: Remember Love’ there is this one line that made me realise about a few important aspects of my life, ‘how a couple flights matters more than how much they fight’. I totally agree with the writer because… well, experience is speaking here. Many couples may not agree, but I guess Gretchen Rubin didn’t intend for every person to agree with her in following the exact same steps. I mean, the reason she added that statement in her book was because of the type of relationship she has with her husband. If I write a book on my happiness project, the root base will be similar to Gretchen Rubin’s but the material will be different. Do you see the confusing bit? Well, there is actually alot that you can learn from her book but the problem is, not everyone can follow all the steps because every single person leads a different life in a different place with different situations and different people. Since Gretchen Rubin IS a writer, it was in some way easier and convenient for her to write a book about the pursuit of happiness and to actually map out all the steps because she likes making lists and ticking off the completed tasks. Not very one has that trait. Another point that caused confusion to the question, ‘Whether this book is worth the time or not?’ is that the book has many scientific references and psychological experiments but scientific and psychological researches on emotions and feelings are not easily acceptable and understandable to the majority of people. There are many people (like me) who believe that science can not give every explanation regarding how the heart and mind works. If a person uses one whole year of her/his life just to see if happiness can be achieved or not with the help of other self-help books, scientific researches and psychological tests, don’t get me wrong, I’m sure any person would be highly impressed by the references provided by her and all the books that she read but it simply isn’t easy to follow some steps written in a book in order for one to be happy for the rest of their lives but on the other hand, you can pick up small bits here and there from the book and make them a permanent part of your life to help yourself in being happy because they will be handy as they are good and practical advices. All I’m trying to say is, the book can not be used as a whole for the pursuit of happiness but a few bits can be picked out which will be needed in every one’s life, for sure.